Enhanced Abilities: Black Mass has super human strength, endurance and durability. Density Manipulation (Self): Black Mass is able to increase or decrease his own mass and size through manipulation of gravitons. Gravity Manipulation: Black Mass is able to manipulate gravity. He can use this power for a number of effects, including: increasing or decreasing an objects mass, flight, concussive blasts, creation of small black holes and force fields. 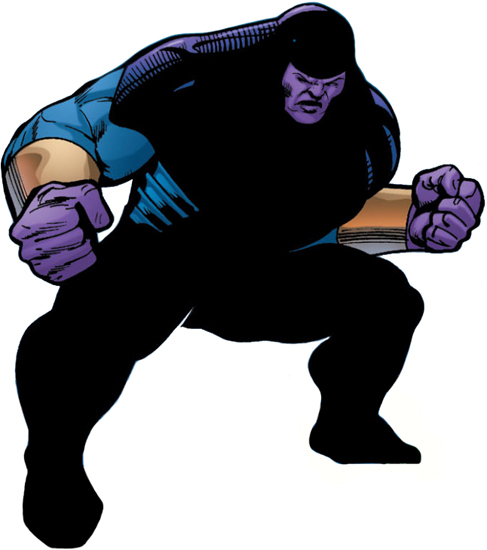 Geoffrey Thibodeux was a small-framed physics prodigy at MIT, who was granted a bulky body and gravity powers by wristbands provided by the Overmaster, who drafted him into the original Cadre under the alias Black Mass.